We are excited to announce that we are now offering a music lesson option for all aftercare, lesson, and summer camp participants! At Blue Water Farms, we share your ideals, and know how important it is to provide a well-rounded education for our children. Now, it is even easier to provide your child with the best possible equestrian education coupled with top instruction in the refined world of music, and all in the same beautiful location on the BWF property. 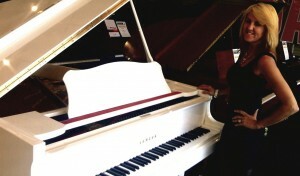 Meet your talented music instructor, Pauline. A graduate from Her Majesty Queen Elizabeth II Royal Academy of Music in the UK, Pauline has been performing professionally since the age of 12, and internationally from the age of 18. With a wide repertoire of experience, Pauline can teach your child(ren) the art of Piano, Keyboard, Acoustic & Electric Guitar, the Organ, Clarinet, and beginner classes of Violin, Cello, Theory of Music, and Composition. She is highly successful in allowing each child to show their potential and develop in their own way according to their unique learning needs. Whether it’s studying the classics, or rocking out to your child’s favorite pop song – they will learn to play in their first lesson, even at the age of 3! Pauline’s distinguished is well-worth mention. She recently wrote, recorded, and produced music that will be featured in the cooking show, “Twice as Good Cooking” on the PBS network. In the past, Pauline has worked as the US Army’s pianist, organist, and choir director, performing for many important occasions, including for the former President Bill Clinton and Hillary Clinton. Her students have had matching success; one having performed for the Ellen Degeneres Show, and another winning first place in the Florida State Strings Division. For information, rates, and to schedule an introductory class, please fill out the form below, and we will be in contact with you within 2 business days.